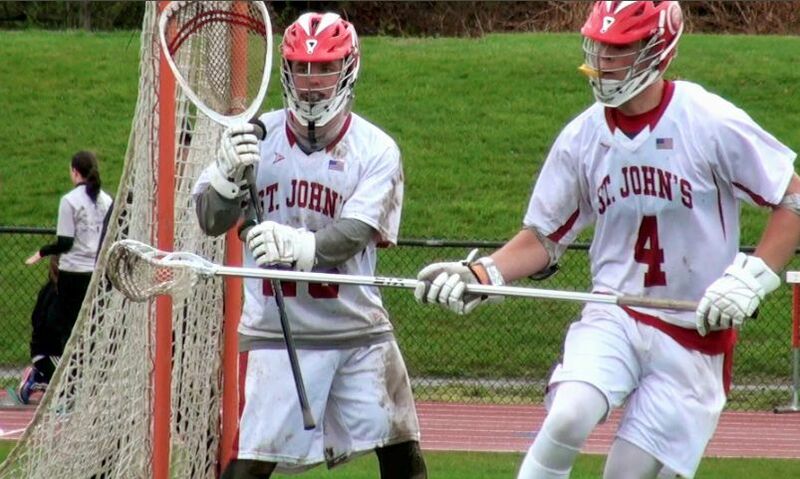 St. John's goalie Matt Mongeau and pole Sam Correnti (4) will be key for the Pioneers against top-seeded Minnechaug. Seven Central Mass lacrosse teams remain alive across three districts and two divisions, but nearly all of them head into this week's semifinals as underdogs. Let's take a look at each team left standing, and what they must do to take the next step. The only D2 bracket to feature Central Mass teams still has two CMass squads alive, but each will enter the semifinals as underdogs against Western Mass powers. The Pioneers head into Tuesday's semifinal at top-seeded Minnechaug looking to avenge an early May defeat at the hands of the Falcons. That day, Minnechaug came to Shrewsbury and put on a passing clinic, slicing up the normally stout St. John's defense, and Minnechaug goalie Brett Jones made life miserable for the Pioneers' usually potent offense. No doubt, most around the state will consider St. John's to be a decided underdog in this one, but the Pioneer defense has been playing very well of late, and St. John's is coming off a game against rival Algonquin where it dominated the face-off X and ground ball battle. If St. John's can win the possession battle, led by middie Liam Doherty at the X and on the ground, it will be impossible to keep attackmen Jack Donahue, Drew Kozub and Brendan Rocco off the board for long. The Pioneers will also need a big game on both ends from middie Andrew Cox, and another stellar day from goalie Matt Mongeau. Poles Devin Greene, Kieran Lyons and Sam Correnti have been roughing teams up the last few weeks, so it will be interesting to see how they play against an undersized, but very quick and extremely skilled Minnechaug attack the second time around. If St. John's can contain Minnechaug's Andrew Fidalgo and Chase Beauchamp, they'll have a puncher's chance against the top-ranked team in the bracket. Westboro will also be facing its toughest challenge of the season, battling a Longmeadow squad that gave Minnechaug its only loss of the year. Led by returning All-American middie Max Stukalin and explosive attackman Will Lukas, Longmeadow is playing its best offensive lacrosse of the year, and boasts a smothering defense led by pole Patrick Abad. Longmeadow's fantastic goalie Matt Pierson hasn't even really been tested yet in the tournament, and Westboro will look to change that, with a potent attack led by Trevor McNamara, and capable midfield headlined by Charlie Katz. McNamara, for his part, has been on a scoring tear lately, scoring 11 goals so far in just two postseason games, but the Rangers will need great games from fellow attackman Jon Gross and pole Nick Gallo. If the Rangers turn this into an up-and-down affair, they have a guy between the pipes that can make the crucial saves to pull the game out. Jeff Bernard has somehow not gotten much attention the last two years, but he's as good between the pipes as anybody in Central Mass. For the Rangers to pull off the upset, they'll need to get their offense going early and often, and they'll need to at least stay above water at the face-off X against Stukalin. Westboro has the firepower and goalie to play with anyone, but they haven't faced a team with the depth and midfield play of Longmeadow yet. It will certainly be an interesting test. D3 Central/East is the only bracket to feature three Central Mass teams, making it also the only one that will feature a Central Mass vs Central Mass semifinal. Our only CMass v CMass game of the round features a pair of Mid-Mass rivals, and two teams who split their regular season series. Grafton will come in as the favorite, despite the fact that Nipmuc knocked off the Indians 9-8 on May 19th. Nipmuc has show an ability to score points in bunches, led by Ryan Richards, Mike Manning and Shane Dougherty. Those three will have to deal with a talented group of poles and LSMs on the Indians' side, most notably Tom Nicalek, Danny Bartosiewicz, Jack Fontana, Ifeatu Melifonwu and Alec Cosseboom. Both teams were impressive defensively in quarterfinal blowouts, with Grafton topping BVT 24-1 and Nipmuc blasting Wahconah 11-1, but it's hard to imagine either team holding the other below 8 or 9 goals. Which team will be able to break through offensively? That might be the deciding factor. Nipmuc's aforementioned threats will have their share of challenges, while Grafton's reshuffled offense, led by now-middie Chase Kapuscienski, and attackmen Cole Fontana and Hunter Fraser, will need to get past Warrior goalie Drew Cannistraro. Allowing just 4.8 goals per game, Cannistraro is the best goalie you haven't heard of, and will be looking for a signature performance against a Grafton team that is respected state-wide. Again, Grafton's the favorite, but Nipmuc has already proven it can defeat the Indians. Should be a great one. The Bernardians will have a tall task against 16-1 Mt. Greylock. The Mounties are the top-seed in the bracket, and are coming off a 19-1 dismantling of Monument Mountain in the quarterfinals. Mount Greylock lost the MIAA's all-time leading scorer in Michael McCormack from last year, but are just as explosive as ever this season, led by Patrick Storie, Reilly Parker and Michael's younger brother Sean McCormack. With a ton of offensive firepower, it's easy to overlook the outstanding play of goalie Cal Filson, who will have the unenviable task of trying to slow down St. B's senior attackman Curtiss Vachon. The Bernardian attackman joined elite company this season, crossing the 400-point mark, and uses a rare combination of size and stick skills to give defenses fits. If St. B's is to pull this one out, it will likely need to score some points. That's where middie Zach Bingham, along with fellow attackmen Nick Bagley and Pat Vachon come in. The Bernardians have the talent to score from anywhere, and all these guys will need to play unselfishly. Forcing things and wasting possessions could lead to the Mounties going the other way, and you don't want to give that offense any extra chances. But, on the opportunities that Mt. Greylock does get, St. Bernard's goalie Sean Kelley will need to be on his game. The Mounties are sure to generate shots and points, but not allowing any soft goals, and making a few robberies will be absolutely necessary. Like the D2 Central/West bracket, D3 Central/East features a pair of CMass squads that both come in as underdogs, with one facing an absolute powerhouse. G-D is probably the biggest underdog of the week, and that has virtually nothing to do with the Crusaders. G-D is capable on both ends, but runs into a juggernaut that has won three of the last four Division 3 state championships, and hasn't been even challenged by a D3 team since losing the state championship game to Cohasset in 2014. Basically, D-S is loaded across the board, but G-D comes in hot, winning three in a row and five of its last six. The Crusaders boast a balanced offense, led by Michael Tammaro, Jack O'Neill and Nick Irby, while sophomore Liam McDonough does a little bit of everything, including excelling at the face-off X. If G-D is going to pull off a historic upset, that's where it will begin. You simply cant let D-S possess and wear on you with all their different weapons. Poles Dillon Eberhardt and Dan Howes will need to play disciplined when the Raiders do have the ball, and goalie Ryan McLean will likely need to play his best game of the year. It certainly won't be easy, but Groton-Dunstable is a talented and battle-tested team. The Crusaders have as good a shot as anybody of knocking D-S off. The Tigers opened their tournament with a convincing win over league rival Tyngsboro, and did so with a combination of crisp passing, ball control, and stellar play between the pipes by goalie Eric Rauker. Against a skilled Weston team that has plenty of offensive firepower, the recipe should be pretty much the same for Littleton. If the Tigers can control the X and get the ball on the stick of Griffin Shoemaker, the offense should put up points, and look for senior pole Ben Church to continue his physical and intimidating play on the other end. The Tigers will also need continued two-way play from middies Anthony Rausa and Adam Canfield, plus some added defense from LSM Cam Shoemaker. The Tigers really are playing their best lacrosse, and they seemed to be loose and having fun when I saw them against Tyngsboro. Weston is a very good team, but if the Tigers play to their potential, they've got a great chance of advancing to the district final. Nipmuc D is also the Defense you haven't heard about. Allowing an average of only 5 goals per game, this young tough group is one to watch. SJ - Chaug could be a good one. Seeing them early helps SJ and they haver played well against teams like BC, Xavarian, Longmeadow and Grafton. Chaug is very well coached, will be the perfect combo of chess match and making fewest mistakes (turnovers/penalties). It wasn't odd. The starters werent playing well so he benched em. Simple as that. Their players not "playing well" might have had something to do with the other team, no? So they were beaten. If they got sick, or suspended, or injured, maybe call it unfortunate, but the coach went with what he thought was best and they were beat. Not a fluke. Sounds like sour grapes. "Whenever my team is beaten, its a fluke, whenever they win it is expected." Firstly anonymous June 8 . He benched them because of lack of performance against a much superior and amazing team. There is that better? The coach did go with who he thought were the better players..... the backup players and alternate goalie!!! Not a fluke.. No sour grapes... The better team won THAT day. Yesterday we played better and Nipmuc without that GREAT goaltending would probably have lost by more. Straight up no B.S. Better team that day won. Good, no fluke...That was the point, except someone called it a fluke. If they did not play because they were hurt, or they were suspended etc...maybe can call it a fluke, but when they get benched by the coach for inability to preform...not a fluke...btw "superior and amazing"....grapes still seem a bit sour. Good luck as you move on. No their are no sour grapes. That day the best team won. you guys EARNED the victory. Thanks for the good luck.